A self-sustaining coconut plantation (located in Villa Escudero, Kilometer 91, Maharlika Hiway, Tiaong, Quezon) owned by the children of Don Arsenio Escudero and Dona Rosario Adap, Villa Escudero Plantations and Resort, having become opened to the public in 1981, has become a charming sanctuary of the rich Philippine cultural heritage. #1 - Museum: Where all Philippine history lovers should first visit as this place has the private things owned by the Escudero’s, which they collected from their overseas as well as local trips. The Escudero family has been well-known in Quezon since the 1800s and in this museum, both Filipino plus foreign tourists can revel in their Chinese porcelain, antique furniture, ethnic clothes, Philippine presidents’ clothes, Jose Rizal’s slum book , and many others. Rustic but terrific! 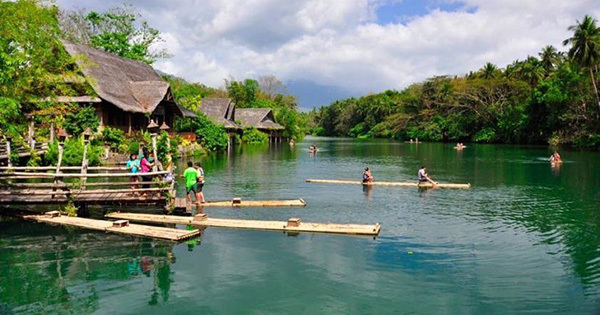 #2 - Labasin Lake: Where travelers to Villa Escudero can do exciting bamboo rafting in addition to staying overnight by means of this area’s available native cabanas. This beautiful lake came about because of the Labasin hydroelectric dam, which is the Philippines’ first working hydroelectric plant, built by no less than Don Arsenio Escudero, the son of this plantation’s founders, Don Placido and Dona Claudia. #3 - Labasin Waterfalls: a.k.a. hydroelectric dam, contains dining tables just below this waterfalls’ spillway, thus providing an open-air restaurant where visitors can savor a nice lunch while their legs are dipped into the 2-feet flowing water. Now, how cool is that?! #4 - Wedding Center: Whether couples are still on the planning stage or are sure to book there for their once in a lifetime blissful wedding, they can check out the Wedding Center, which can provide them traditional Filipino food on top of a serene and unpolluted lush environment; not to mention the chance to ride a traditional horse-drawn carriage after their wedding, instead of the usual car or limousine, that are common for this occasion. #5 - Philippine Experience Show: provides all tourists world-class entertainment featuring Philippine cultural dances and songs that they will truly remember forever! #6 - Swimming Pool: guests can end their tour in Villa Escudero via a dip into their cool and clear swimming pool where they can relax or unwind after accomplishing all their wonderful to do’s in this oh-so-spectacular resort and plantation, indeed a gem in this nation!